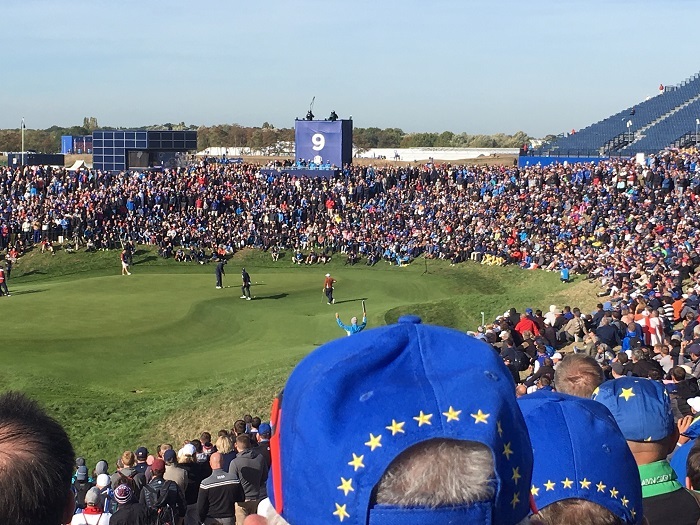 The European Tour newsletter plopped into my inbox on Wednesday and I was interested to see they were showcasing the European Tour Photo of the Year, highlighting the top two dozen pictures taken at ET events throughout 2018. What’s more, they are supplying a little explanation from each photographer telling us how they set up the picture, waited for the right light and shadow and how sometimes it’s just a photographer’s instinct that leads them to be in the right place at the right time. It’s well worth having a look. And so I decided, in this final blog of the year, to select a handful of our blog pictures that reflect and remind me of the somewhat haphazard journey this blog takes throughout the course of twelve months. So, here goes……. 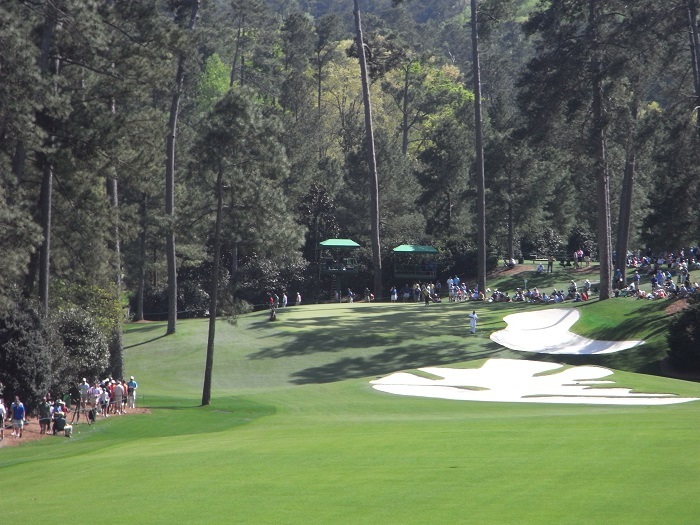 My effort to capture the much photographed 10th hole at Augusta. Taken with an ipad mini in under three seconds. No slow play for me! 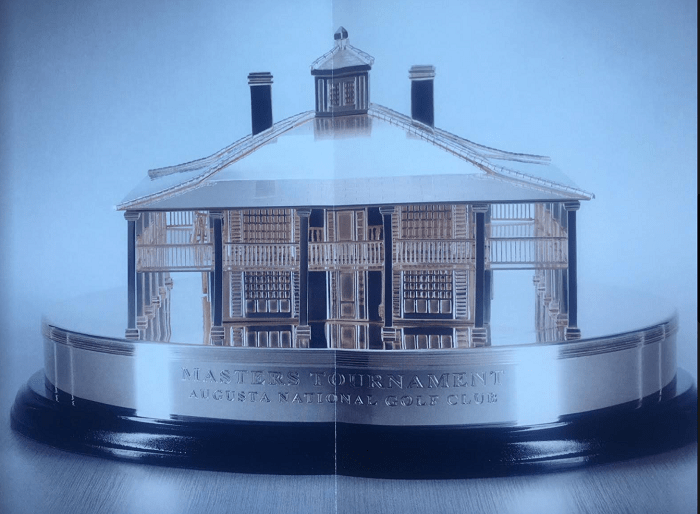 Everyone knows about the coveted Green Jacket, but here’s the actual Masters Trophy awarded each year to the champion. Probably one of the least recognisable trophies there is in the world of sport. Portrush’s Ricky Elliott bags his second major of the year. 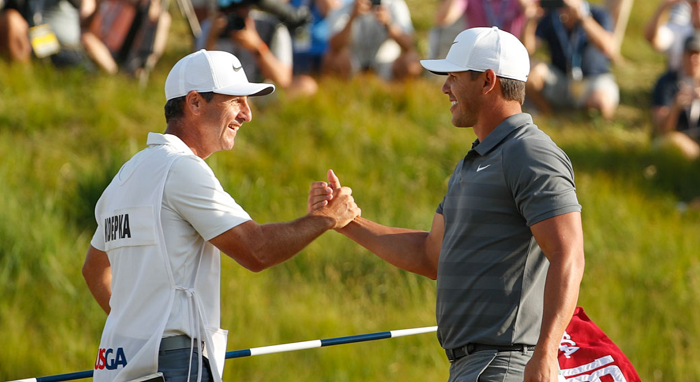 The guy on the right , Brooks Koepka, who finished the year as world No 1, accompanied him through thick and thin. 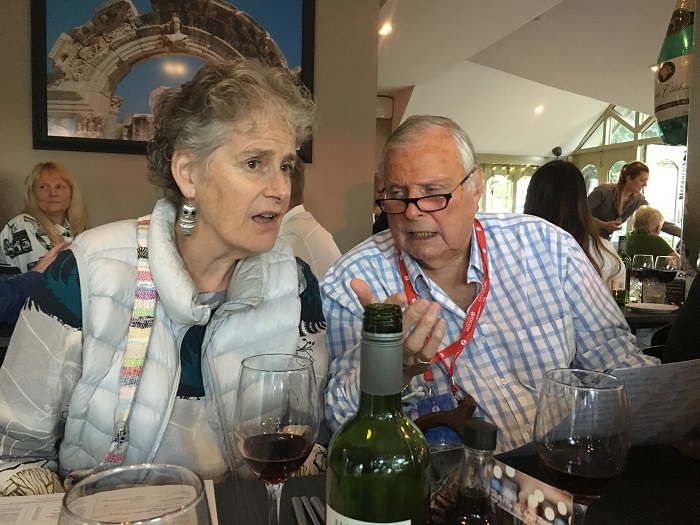 Patricia and the great Peter Alliss at the Women’s British Open, doing what they both do best….talking! 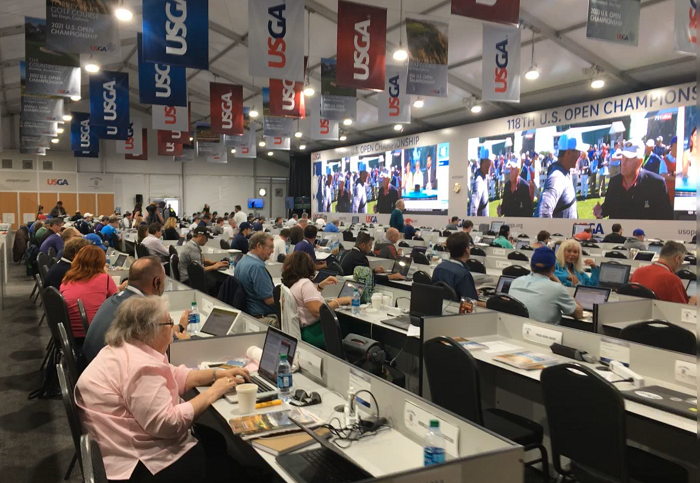 Media centres were Patricia’s workplace for so many years. Now my home for the majors. All ease and grace. 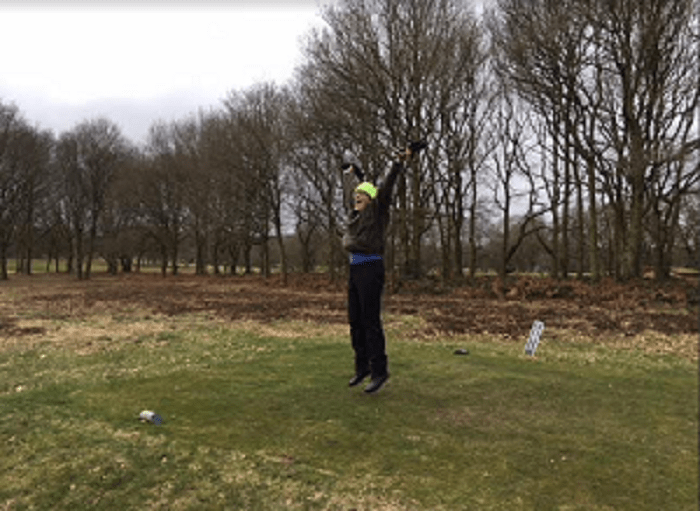 Patricia’s turn to jump for joy….on discovering the removal of the three ill-placed gorse bushes that had for years gobbled up numerous tee shots at the 8th hole at Whittington Heath. 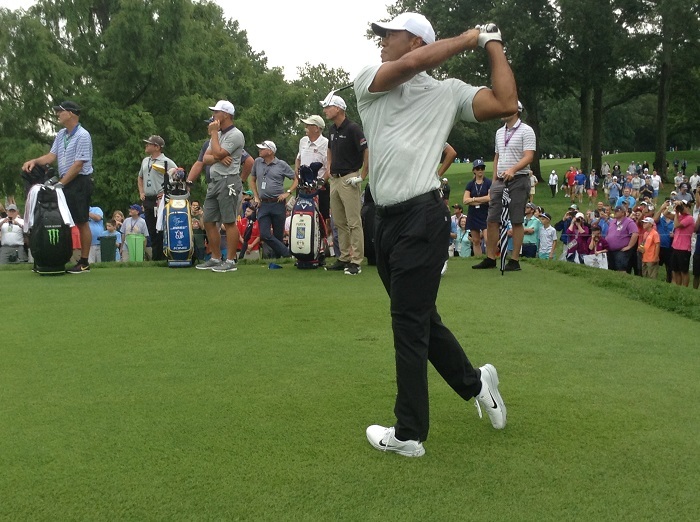 Still in the game: Tiger Woods at the USPGA in St Louis. He would win on the PGA tour for the 80th time before the year’s end. Paris in autumn time. An unforgettable Ryder Cup in so many ways. Allez les bleus! The European Club is one of my very favourite places in golf and I love the whole golfing experience there. My pal Gill Stewart, however, wasn’t that impressed with their club fitting service! 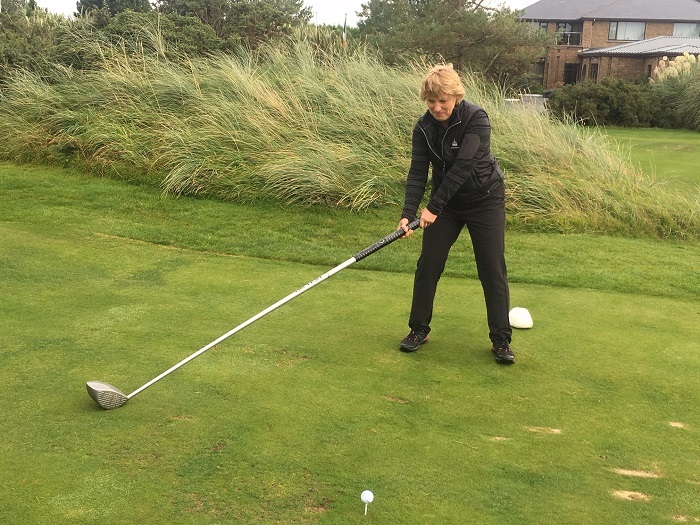 And finally, I just had to finish my pictorial blog round-up with a little look to the future and the exciting hosting of next year’s Open at one of my clubs, Royal Portrush. Put it in your diaries and I’ll see you there. In the meantime, have a very happy festive season and good golfing in 2019. 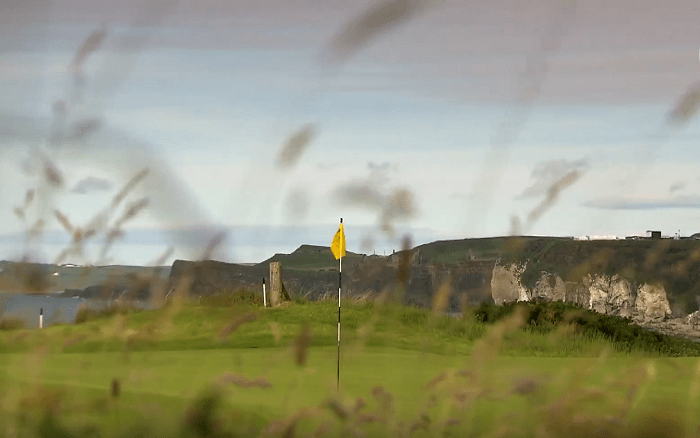 Royal Portrush – a warm welcome awaits the world of golf next July. I was at a funeral in Dublin on Monday, to say goodbye to Colm Smith, who was the very best of friends. 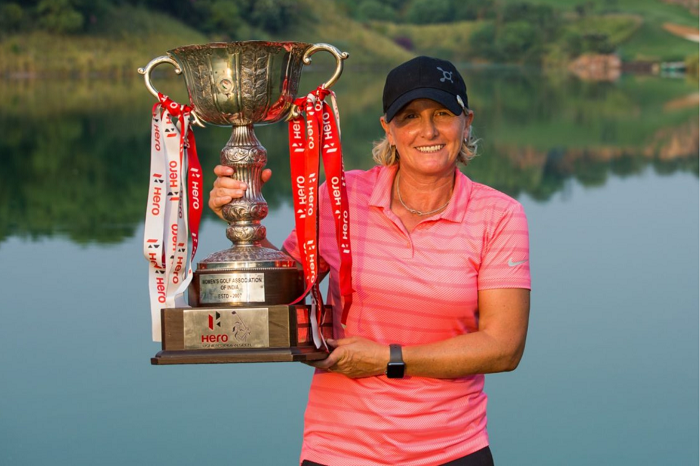 Maureen and I first met Colm many years ago when we were playing junior golf and he was working for the Irish Independent, in the far-off days when papers covered the full gamut of golf, big and small, female and male, amateur and professional. Colm, who was a good tennis player, also covered rugby – he was on the Lions tour of South Africa in 1974, a life-changing trip – and when he became the Indo’s golf correspondent, he and Dai became good friends. So we go back a long way. 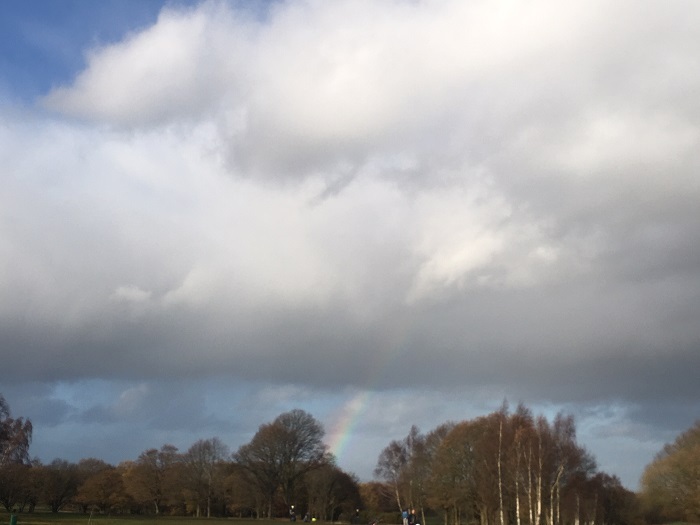 It’s one of mine, so it’s not the best picture but you can just make out the rainbow that appeared the day I heard that Colm had died. 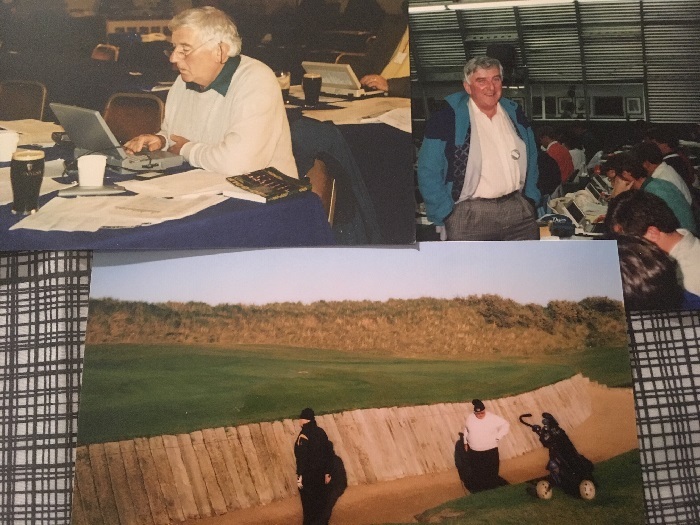 At first, when I was trying to think of Colm-related anecdotes, all I could see was a series of snapshots from all over the golfing world, of Dai and me with Colm and Helen, his second wife, who died five years ago, laughing, with Seve; with the Christy O’Connors, Padraig, the mighty Mary McKenna, Irish golfers of every generation; with Maria Acacia and her team in charge of press rooms at Valderrama and all over Europe; with Charlie Yates at the press parties at the Masters at Augusta; drinking Guinness at The Goat in Dublin, vinho verde in Portugal with golf writing friends; at home…..the list goes on and on. 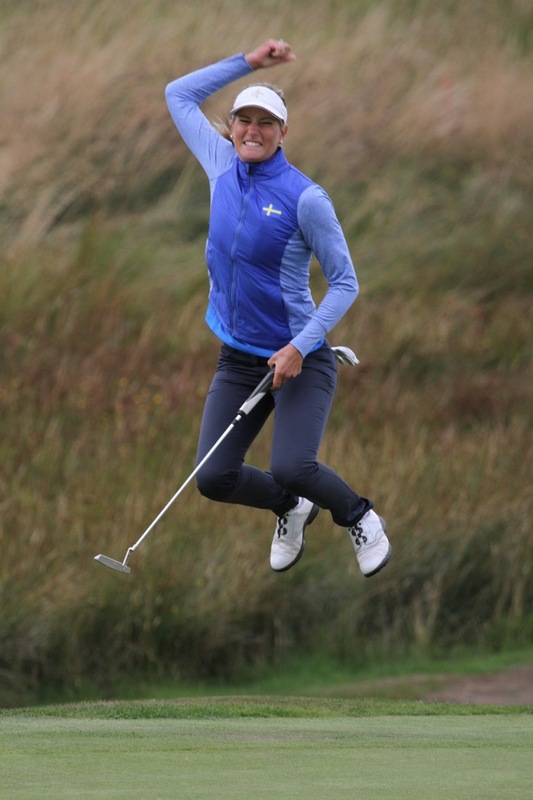 But I’m not the one to talk to about the golf writers’ home internationals because I only played the once – when they were desperate for an extra bod and even a woman would do. 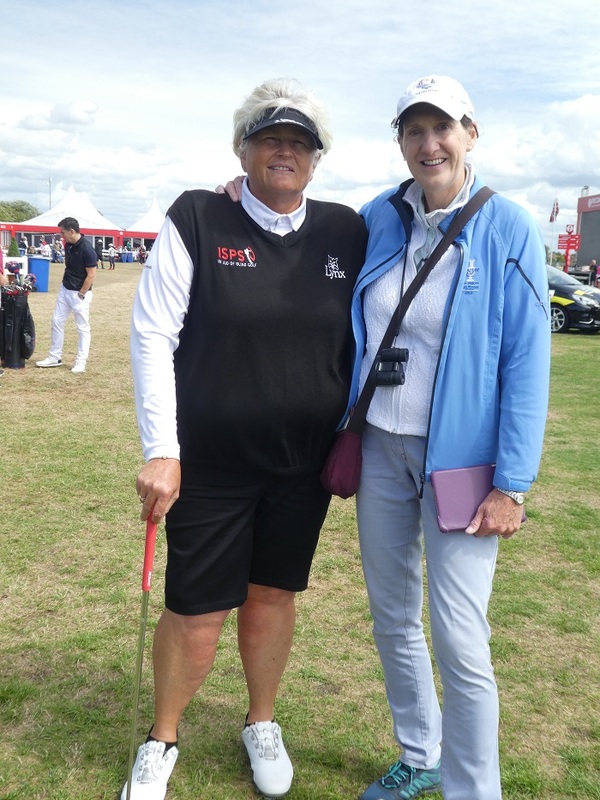 Then Mo reminded me that one year at the Masters she had gone to the Saturday night party, when we sailed up Magnolia Lane as welcome guests, invitation to the fore, as Colm’s date – Helen was at home in Ireland working. I’d forgotten that we wandered in to the locker room and mooched about taking in the atmosphere, peering at the immaculately polished shoes, even, scandalously, having a go with Jesper Parnevik’s ultra weird putter du jour. Can’t really believe that Mo, a pro, would have sanctioned taking another pro’s club out of his bag without permission but we treated it with appropriate reverence, honest Jesper. That might have been the year that I nicked an Augusta National glass from the bar, smuggling it out in Colm’s jacket pocket. That was probably when the barman, who didn’t miss a trick, said, “I sees you but I ain’t telling.” Good man and I’m sure he’s long retired now. I don’t usually steal things but that glass has pride of place on my shelf – yes, miraculously it’s still intact. I have no idea what its function is – apart from looking decorative – because it’s a bit small for wine and a tad too big for port but I love it and love the fact that Colm was happy to do the needful. I’m sure that if I’d asked Charlie he’d have given it to me but where’s the frisson in that! Snapshots of Colm, clockwise from top left: composing; posing (Augusta’s Quonsett hut; and, I suspect, fearing the worst. That’s the bunker guarding the 18th green at Royal West Norfolk and Dai, right, steam emerging from ears, has failed to get out first time. Mind you, it was foursomes so that means that Colm stuck the ball in there in the first place. The day that Dai died Colm had flown over from Dublin to see him and it was a real comfort to have him there. I’ll never forget Mo, Colm and me standing in the garden at St Giles Hospice, laughing our legs off because I’d just revealed Dai’s last word to me – SHUSH……No one will believe this I’d thought, before realising that, on the contrary, everyone who knew us would. It was, I have to confess, perfect. RIP dearest Colm and condolences to your family and many friends. Life and golf go on and the Maguire twins, two of Ireland’s finest, are in Marrakesh for LET Pre-Qualifying B at Amelkis GC. If they get through that, they’ll play in the final stage later this month. Good luck to them but whatever happens, they’ll be okay. They’re smart women as well as good golfers and we’re lucky to have them. 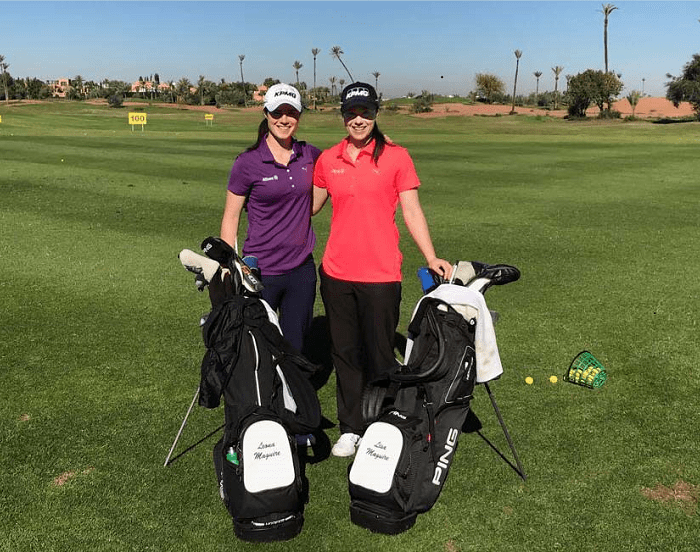 Lisa Maguire, right and twin sister Leona, ready for the LET qualifying school. Finally, this being the time of year it is, Mo and I would like to wish our reader(s) a Merry Christmas and Happy New Year and say thank you so much for reading. 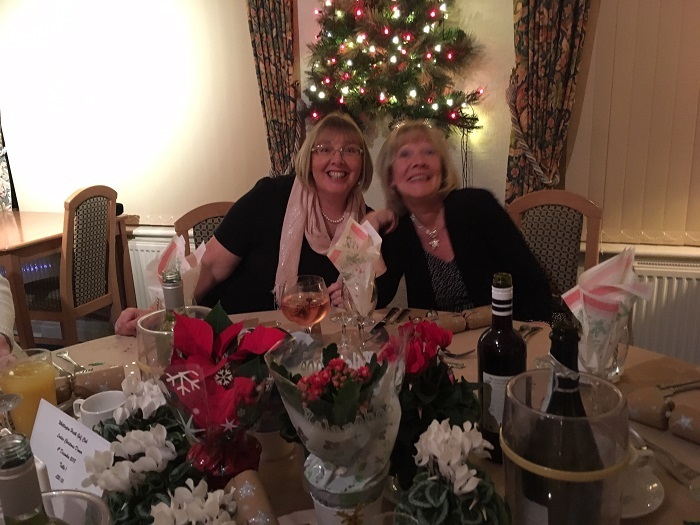 Happy Christmas to all from the wonderful women of Whittington Heath. I couldn’t resist putting this picture in. Maureen’s post box collapsed recently and at my suggestion she’s been using a plastic box for the time being. Unfortunately, the lid doesn’t fit too well and it couldn’t cope with all the rain we’ve had recently, so the mag emerged a little the worse for wear. Well, a lot the worse for wear, its contents a mystery, shredded beyond comprehension. 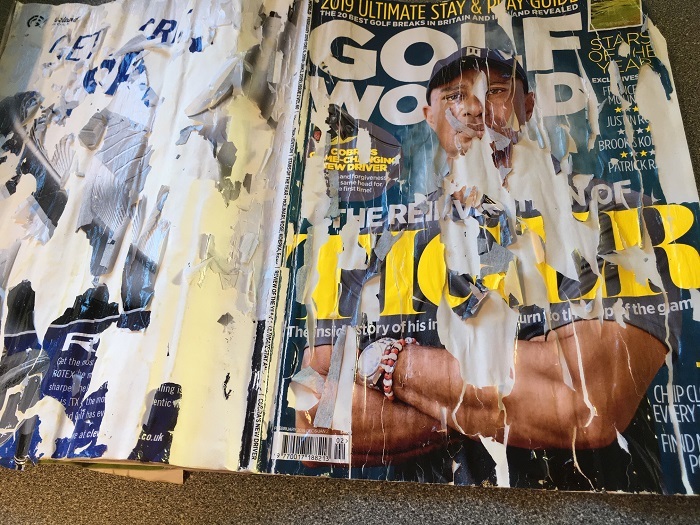 Golf World now unreadable after being caught in the rain. Sorry Mo.